Your thyroid is a small butterfly-shaped gland found at the base of your neck, just below your Adam’s apple. This gland makes thyroid hormone that travels in your blood to all parts of your body. The thyroid hormone controls your body’s metabolism in many ways, including how fast you burn calories and how fast your heart beats. Thyroid Cancer Survivors’ Association, Inc. Problems with your menstrual period. Your thyroid helps control your menstrual cycle. Too much or too little thyroid hormone can make your periods very light, heavy, or irregular. Thyroid disease also can cause your periods to stop for several months or longer, a condition called amenorrhea. If your body’s immune system causes thyroid disease, other glands, including your ovaries, may be involved. This can lead to early menopause (before age 40). Problems getting pregnant. When thyroid disease affects the menstrual cycle, it also affects ovulation. This can make it harder for you to get pregnant. Problems during pregnancy. Thyroid problems during pregnancy can cause health problems for the mother and the baby. Are some women more at risk for thyroid disease? Screening for thyroid disease is not recommended for most women. What kinds of thyroid disease affect women? Hypothyroidism (hy-poh-THY-roi-diz-uhm) is when your thyroid does not make enough thyroid hormones. It is also called underactive thyroid. This slows down many of your body’s functions, like your metabolism. The most common cause of hypothyroidism in the United States is Hashimoto’s disease. In people with Hashimoto’s disease, the immune system mistakenly attacks the thyroid. This attack damages the thyroid so that it does not make enough hormones. You also may have high LDL or “bad” cholesterol, which can raise your risk for heart disease. Hypothyroidism is treated with medicine that gives your body the thyroid hormone it needs to work normally. The most common medicines are man-made forms of the hormone that your thyroid makes. You will likely need to take thyroid hormone pills for the rest of your life. When you take the pills as your doctor tells you to, the pills are very safe. Hyperthyroidism , or overactive thyroid, causes your thyroid to make more thyroid hormone than your body needs. This speeds up many of your body’s functions, like your metabolism and heart rate. The most common cause of hyperthyroidism is Graves’ disease. Graves’ disease is a problem with the immune system. What are the signs and symptoms of hyperthyroidism? Hyperthyroidism raises your risk for osteoporosis, a condition that causes weak bones that break easily. In fact, hyperthyroidism might affect your bones before you have any of the other symptoms of the condition. This is especially true of women who have gone through menopause or who are already at high risk of osteoporosis. Antithyroid medicines block your thyroid from making new thyroid hormone. These drugs do not cause lasting damage to the thyroid. Beta-blockers block the effects of thyroid hormone on your body. These medicines can be helpful in slowing your heart rate and treating other symptoms until one of the other forms of treatment can take effect. Beta-blockers do not reduce the amount of thyroid hormones that are made. Radioiodine. This treatment kills the thyroid cells that make thyroid hormones. Often, this causes permanent hypothyroidism. Surgery. Thyroid surgery removes most or all of the thyroid. This may cause permanent hypothyroidism. Thyroiditis is inflammation of the thyroid. It happens when the body’s immune system makes antibodies that attack the thyroid. Two common types of thyroiditis are Hashimoto’s disease and postpartum thyroiditis. Postpartum thyroiditis, or inflammation of the thyroid after giving birth, affects 10% of women.3 It often goes undiagnosed because symptoms are much like the “baby blues” that may follow delivery. Women with postpartum thyroiditis may feel very tired and moody. The first phase starts 1 to 4 months after giving birth and typically last 1 to 2 months. In this phase, you may have signs and symptoms of hyperthyroidism because the damaged thyroid leaks thyroid hormones out into the bloodstream. The second phase starts about 4 to 8 months after delivery and lasts 6 to 12 months. In this phase, you may have signs and symptoms of hypothyroidism because the thyroid has lost most of its hormones or because the immune attack is over and the thyroid may recover later. Your immune system may cause postpartum thyroiditis. If you have an autoimmune disease, like type 1 diabetes, your risk is higher. Treatment for postpartum thyroiditis depends on the phase of the disease and what symptoms you have. For example, if you get symptoms of hyperthyroidism in the first phase, your treatment may include medicines to slow down the heart rate. In most women who have postpartum thyroiditis, the thyroid returns to normal within 12 to 18 months after symptoms start. But if you have a history of postpartum thyroiditis, your risk is higher for developing permanent hypothyroidism within 5 to 10 years. Usually, the only symptom of a goiter is a swelling in your neck. It may be large enough that you can see it or feel the lump with your hand. A very large goiter can also cause a tight feeling in your throat, coughing, or problems swallowing or breathing. Your doctor will do tests to see if it is caused by another thyroid disease. You may not need treatment if your thyroid works normally and the symptoms do not bother you. A thyroid nodule is a swelling in one section of the thyroid gland. The nodule may be solid or filled with fluid or blood. You may have just one thyroid nodule or many. What are the signs and symptoms of thyroid nodules? Most thyroid nodules do not cause symptoms and are not cancerous.8 Some thyroid nodules make too much thyroid hormone, causing hyperthyroidism. Sometimes, nodules grow so big that they cause problems with swallowing or breathing. About one-third of nodules are found by the patient, another third by the doctor, and the other third through an imaging test of the neck. You can sometimes see or feel a thyroid nodule yourself. Stand in front of a mirror and raise your chin slightly. Look for a bump on either side of your windpipe below your Adam’s apple. If the bump moves up and down when you swallow, it may be a thyroid nodule. Ask your doctor to look at it. How are thyroid nodules treated? Watchful waiting. If your nodule is not cancerous, your doctor may decide to just watch your condition. You will get regular physical exams, blood tests, and perhaps thyroid ultrasound tests. If your nodule does not change, you may not need further treatment. Surgery. Surgery may be necessary to take out nodules that may be cancerous or large nodules that cause problems breathing or swallowing. Radioiodine. This type of treatment is helpful if you have nodules that make too much thyroid hormone. Radioiodine causes nodules to shrink and make smaller amounts of thyroid hormone. Thyroid cancer happens when cancer cells form from the tissues of the thyroid gland. Most people with thyroid cancer have a thyroid nodule that does not cause any symptoms. If you do have symptoms, you may have swelling or a lump in your neck. The lump may cause problems swallowing. Some people get a hoarse voice. To tell if the lump or nodule is cancerous, your doctor will order certain tests. Most thyroid nodules are not cancerous. For more information about thyroid cancer, visit the National Cancer Institute’s thyroid cancer page. Who is at risk for thyroid cancer? About three times as many women get thyroid cancer as men. The number of women with thyroid cancer is also going up. By 2020, the number of women with thyroid cancer is expected to double, from 34,000 women to more than 70,000 women. The main treatment for thyroid cancer is surgery to take out the whole thyroid gland or as much of it as can be safely removed. Surgery alone can cure thyroid cancer if the cancer is small and has not yet spread to lymph nodes. Your doctor may also use radioiodine therapy after surgery. Radioiodine therapy destroys any thyroid cancer cells that were not removed during surgery or that have spread to other parts of the body. Your doctor may also talk with you about other treatments for thyroid cancer. Learn more about thyroid cancer treatments at the National Cancer Institute. It can be hard to tell if you have a thyroid disease. The symptoms are the same as many other health problems. Your doctor may start by asking about your health history and if any of your family members has had thyroid disease. Your doctor may also give you a physical exam and check your neck for thyroid nodules. Blood tests. Testing the level of thyroid stimulating hormone (TSH) in your blood can help your doctor figure out if your thyroid is overactive or underactive. TSH tells your thyroid to make thyroid hormones. Depending on the results, your doctor might do another blood test to check levels of one or both thyroid hormones in your blood. Radioactive iodine uptake test. For this test, you swallow a liquid or capsule that holds a small dose of radioactive iodine (radioiodine). The radioiodine collects in your thyroid because your thyroid uses iodine to make thyroid hormone. High levels of radioiodine mean that your thyroid makes too much of the thyroid hormone. Low levels mean that your thyroid does not make enough thyroid hormone. Thyroid scan. 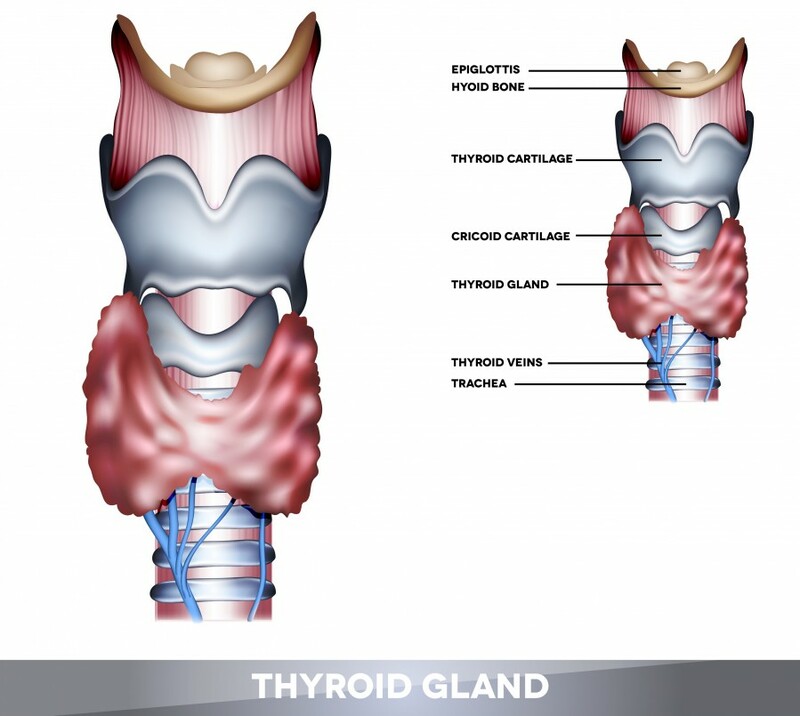 A thyroid scan uses the same radioiodine dose that was given by mouth for your uptake test. You lie on a table while a special camera makes an image of your thyroid on a computer screen. This test shows the pattern of iodine uptake in the thyroid. “Hot” nodules. These thyroid nodules show up on the scan more brightly than normal thyroid nodules. They take up more radioiodine than the surrounding thyroid. They also make more hormone than normal thyroids. Less than 1% of these nodules are cancerous. “Warm” nodules. These nodules take up the same amount of radioiodine as normal thyroid and make a normal amount of hormones. Only 5% to 8% of these nodules are cancerous. “Cold” nodules. These nodules show up as as dark areas on the scan. They do not take up much radioiodine and do not make thyroid hormones. Many nodules are cold. Up to 15% of these nodules are cancerous. Thyroid ultrasound. The thyroid ultrasound uses sound waves to make a picture of the thyroid on a computer screen. This test can help your doctor tell what type of nodule you have and how large it is. You may need more thyroid ultrasounds over time to see if your nodule is growing or shrinking. Ultrasound may also be helpful in finding thyroid cancer, although by itself it cannot be used to diagnose thyroid cancer. Thyroid fine needle biopsy. This test tells whether thyroid nodules have normal cells in them. Your doctor may numb an area on your neck. Your doctor will then stick a very thin needle into the thyroid to take out some cells and fluid. A doctor will then look at the cells under a microscope to see if they are normal. Cells that are not normal could mean thyroid cancer. Can thyroid disease cause problems getting pregnant? Thyroid problems can also affect the menstrual cycle. Your periods may be heavier or irregular, or you may not have any periods at all for several months or longer (called amenorrhea). How does thyroid disease affect pregnancy? Pregnancy-related hormones raise the level of thyroid hormones in the blood. Thyroid hormones are necessary for the baby’s brain development while in the womb. It can be harder to diagnose thyroid problems during pregnancy because of the change in hormone levels that normally happen during pregnancy. But it is especially important to check for problems before getting pregnant and during pregnancy. Uncontrolled hyperthyroidism and hypothyroidism can cause problems for both mother and baby. Preeclampsia , a serious condition starting after 20 weeks of pregnancy. Preeclampsia causes high blood pressure and problems with the kidneys and other organs. The only cure for preeclampsia is childbirth.